I sort of learned to dress myself at a young age. I mastered zippers, buttons, buckles and, ultimately, tying shoelaces. I say “sort of” because although I learned how to put clothing on, apparently, I never learned how to choose which clothes to put on. For example, this very day I had an appointment in Denver, a very fashionable city a mere two hour drive from our rustic rural home. It was for a legal matter. I selected my favorite sports jacket. My beloved wife, a former model, informed me that my favorite coat was not her favorite coat. She selected another one. I complied, of course. I inquired whether the tie I already had tied goes well enough with the coat I had not intended but was then wearing. It was okay. She explained why — something about subtle green tones. I said above that I know how to tie my shoes, and that is true, but the only shoes I have with laces are gym shoes. Otherwise, I always wear cowboy boots, even to court. Miss Sugar asked which pair of boots I was going to wear, then looked at my socks and gasped. I had a hole in my left sock. I explained that when my boots were on, no one would know that I had a sock with such a hole. The conversation turned to what I thought was an urban myth, but which is, according to Sugar, common knowledge as a universal truth. That is, and you readers probably know this already — if one gets in an accident, the emergency personnel are shocked by dirty underwear. A corollary to such common knowledge about the disadvantages of dirty underwear is that if one has a hole in one’s sock, the health care professionals often refrain from assisting. I suppose it follows that if one does not care enough about one’s self to wear clean underwear and intact socks, then why expect anyone else to care? Further, as you know, mothers and wives take it personally when anyone in their care presents to EMTs in such a manner that it is clear the injured person is unloved by mother or wife. The fear is that such an injured person will be refused an ambulance ride and refused admission to the emergency room at any hospital. In addition, the photos of such a person’s wife and/or mother will be displayed on the front page of every newspaper in the nation as the party responsible for the unacceptable socks or underwear. And, on the six o’clock news for pity’s sake. We just couldn’t take that chance of humiliating Miss Sugar, so I put on a sock that would not bring embarrassment to the family. I made the round trip without any incident. I did not want to be in a traffic accident, but I was ready to be seen without my boots on just in case. I was fixin’ to do some pull-ups at the gym today when a little guy, probably a foot shorter than me, got to the pull-up bar first. I walked away when I saw how many he was doing. It is a firm principle of mine to not embarrass myself. I decided to sneak back later after this gymnast-type finished his multiple sets. So I went over to the free weights. There was a muscleman there. He was in his twenties with huge arms. He tucked his tee shirt sleeves in to have the sleeveless look, the better to display those arms. I, on the other hand, did not tuck in my sleeves. I modestly chose to not display my huge arms. Well, I was not entirely modest, for I was wearing my Senior Olympics shirt. Maybe that intimidated him. He might have scoffed, but I like to think he was choking up with admiration. As we stood there, facing the mirror, I noticed that we were each curling the same amount of weight on our respective barbells. I make it a point to notice stuff like that. I made sure I did as many reps as that whippersnapper. I’ve been around ya know. I was competitive with this big kid if not the little gymnast. This muscle shirt guy was more my stature. Then he topped me. He walked up closer to the mirror, lifted the front of his shirt and checked out his six-pack abs. He was not that sly. He was unabashed. I decided to keep my shirt down. Comparing abs definition is where I draw the line. After my workout, I went to the steam room. I made sure I stayed in longer than anyone else. It is a matter of competitive pride. You shoulda been there. I was really somethin’. President Abraham Lincoln was assassinated 150 years ago, on April 15, 1865. 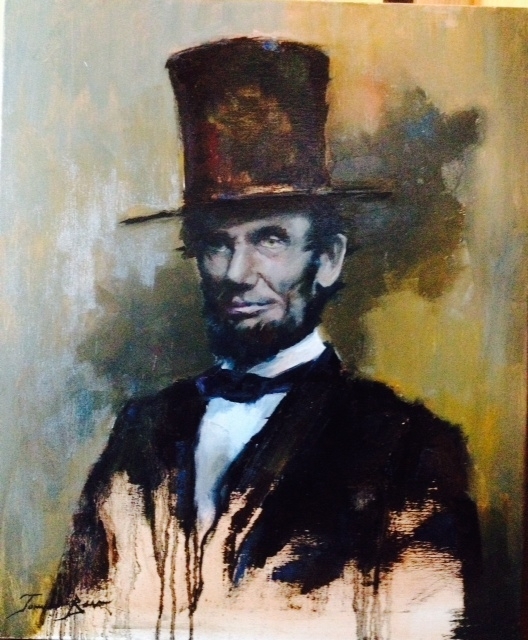 Yesterday, Johnny L. Bone, an artist friend, sent my wife and me an original oil portrait of President Lincoln. Apparently, Sugar had told Johnny about my interest and collection. Many years ago, I had an internship in the Washington D.C. office of Senator Mark O. Hatfield. Senator Hatfield, who had taught Political Science at a university before entering politics himself, was a Lincoln scholar. He had a good collection of books about Abraham Lincoln. While I lived in D.C., I read several biographies of Lincoln and started my own modest collection. I visited the Lincoln Memorial and Ford’s Theater and the house across the street where the president died. In the basement of Ford’s Theater is a gift shop. I bought a poster of a photograph of President Lincoln. I had it framed. It has been in my law office for my entire career. Somewhere along the way, I purchased a model of Lincoln’s head, said to be by the artist who sculpted the statue in the Lincoln Memorial. The stone came from Colorado, I was told. That story by the antique dealer could not be authenticated or the price would have been more. Nevertheless, I like to think that I have a head of Lincoln done for practice on the monument. Now I am proud to have the original oil portrait by Johnny L. Bone. Aaron Hernandez and Dzhokhar Tsarnaev are convicted murderers, each having killed due to twisted values. Aaron Hernandez let his priority be to not tolerate disrespect. He was a talented NFL tight end for the Patriots. It is a shame he did not make his career and his family more important than his gangsta friends and the misplaced value of avenging disrespect, real or perceived. He was convicted this week of killing his friend, Odin Lloyd, who was dating the sister of Aaron’s fiancee, who is also the mother of his child. So, he knew the victim. The evidence presented at trial convinced the jury that Hernandez killed Lloyd, not in the heat of anger, but, it seems, as revenge for some slight that occurred at a nightclub a day or two before. It was not even a “showdown” because Lloyd apparently thought they were meeting to hang out. It was a sneaky murder, as I understand the news reports of the trial. Hernandez brought along a couple other buddies. Ambush does not seem tough. Three against one is not so tough either. But they did “teach?” Lloyd that no insult to Hernandez goes unpunished. There will be another trial for charges of shooting and killing two young men Hernandez ran into at another club. He believed he was wronged by one of them over an accidentally spilled drink. The alleged double murder was accomplished by shooting both from a car into their car. Again, not exactly a brave showdown. Dzhokhar Tsarnaev has now been convicted for the Boston Marathon bombing that killed, maimed and wounded many people. His reasons to kill innocent people are even more far-fetched. His terrorist acts were supposedly motivated by his hatred of America and influence of his brother. He was, I guess, teaching America a lesson. He was given opportunities in America which he accepted, such as a high school and college education. But that was not enough. I don’t understand what he expected. Maybe America was not converting to Islam fast enough. America did not fix the problems in his native country, Chechnya, in the Russian Federation. His family sought asylum in the United States. This is how he and his brother repaid the favor. His values concerning loyalty to his homeland and his Muslim faith apparently led him to become a terrorist murderer. Some say that the death penalty, while deserved, might be doing him a favor by making him a martyr. I don’t know what to do with these two young men. What they did was evil. May God have mercy on their souls. I am not God. I am not entirely merciful. The kindergartener naturally did not find them funny. The teasing made him sad. The fourth grader was skinny and small. No match for sixth graders one might assume. Wrong. The little girl quickly climbed the steps to the top of the slide. She got behind the two sixth grade boys. That was unfortunate for them. The little girl was outraged by the cruel teasing. She knew the kindergartener as a family friend. She knew his parents. She knew his older brother. She knew it was wrong to pick on him. She knew what to do. Behind the boys on the top of the slide, the girl kicked them. Hard. They started sliding down. Their hands lost their grip. They landed on their backs at the bottom of the slide. Together, in the dirt. Hurts, don’t it? A teacher on playground duty saw only the kicks and the resulting difficult landing suffered by the bullies. She grabbed the little girl and told her it was wrong to kick those boys. She should have been patient while waiting her turn to slide. She lost her playground privileges. She was a bad girl. She needed to learn her lesson. The lesson was not the one the teacher intended. The lesson was one she had already been taught. At home, the girl told the story. Her father told her how proud he was of her for sticking up for the little boy. He promised to back her 110%. A lawyer, he valued sticking up for the weak. He valued fighting bullies. He encouraged it. He had watched too many cowboy movies. So had the heroic little girl. And don’t think the kindergartener missed what happened. He was grateful to have someone stick up for him, even if it was a girl. That was back in the 90s. Bullying seems to get more attention now. I don’t judge the poor victims of bullying. I do wonder about the kids who fail to protect their peers. Sometimes there might be no friends around or no friends period. But I will say this, the ones who fail to stick up for the victims of bullying are part of the problem. They should be ashamed. Not everyone has the strength to take on bullies, at least not alone. But there is strength in numbers. And there is strength in being right. P.S. Later in the year, there were Student Council elections. The little girl ran for secretary. The staff told her that traditionally sixth graders are the officers. Upon advice of counsel, the girl asked where that rule was written down. Turns out it was not an official rule. 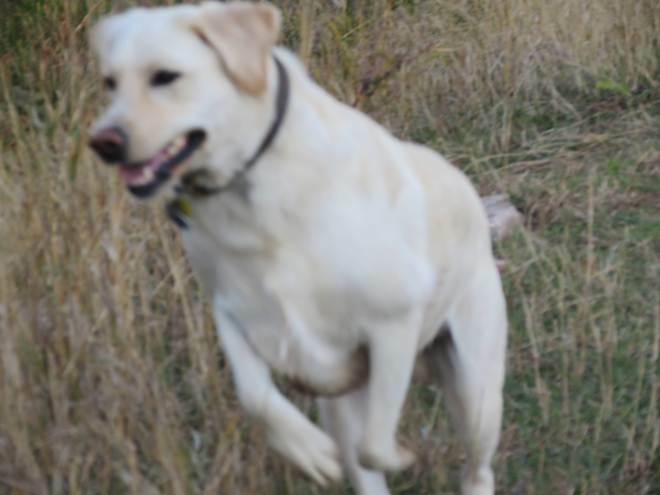 She ran. I expect that she had the kindergarten vote. Her little sister in first grade campaigned for her too. (She explained her strategy to me. The sixth graders would split their votes as all the other candidates were in sixth grade. “I think the little kids will vote for me.”) She won the election. Her father was proud, again. Neutrality is an expensive option. When you see someone being wronged and fail to take the side of the one being wronged you reward the wrongdoer. Then the one who was wronged suffers more wrong by your lack of support. If you care for two people and one of them wrongs the other, you must take the side of the one wronged. If you remain neutral you lose the affection and respect of the one who was wronged. If you do not remain neutral you only lose the affection of the wrongdoer. But you uphold what is right when you condemn the wrongdoer. Better that you lose the wrongdoer than the one wronged. The Menninger brothers were famous psychiatrists who ran a wonderful world renowned clinic in Topeka, Kansas. I read remarks by one of them once when I was young about what he called the sin of apathy, which he described as the failure to take the right side when evil is done. He described the tendency to try to remain neutral and avoid taking sides as a very serious evil because it rewards evil. He was right. Neutrality is a wonderful reward to wrongdoers and only adds to the harm of the one who is wronged. My good friend, Walter J. Hopp, wrote this a few years ago, as notes to his children from their father. They have a wise father. What should seem obvious is difficult for many well-intentioned people to follow. They believe that they are being “nice” by not taking sides. Instead, like the nations which did not stand up to Hitler initially, they enabled evil.